10 x 3in Star Drive Gold Star Cabinet Screw / 63 ct 1lb Jar approx. Includes Free T-25 Bit Round washer head. Extra Sharp Point with Type 17 Auger Point, deep sharp threads, spiral cut thread, hardened steel, ACQ Compatible Coating for long life. 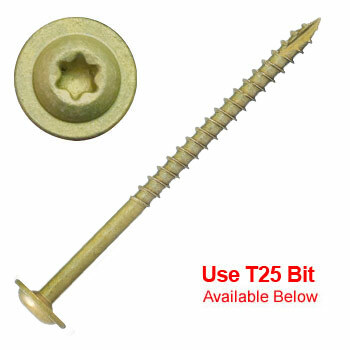 (See our Silver Star Stainless Steel wood screws line for use with Cedar and Redwood). Available in 1lb, 5lb and Bulk. Use T25 Star Drive Bit for reduced camout and elimination of twist-off.